Literacy Centers are an important part of your students reading standards. This literacy station is quick to prep and easy to use. 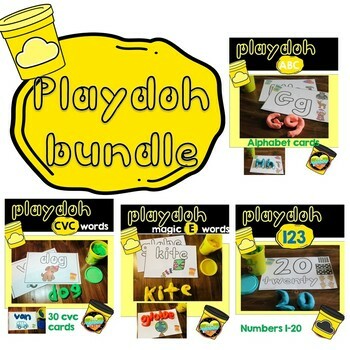 Your students will love practicing the important skill of Alphabet and beginning sounds with play doh. These cards are 1/2 page and easy on the ink. Literacy Centers are an important part of your students reading standards. This literacy station is quick to prep and easy to use. Your students will love practicing the important skill of CVCc with play doh. There are 6 cards for each of the vowels aeiou. Your students will love practicing the important skill of CVCE with play doh. There are 6 cards for the vowels A, I, O and U.This center is quick to prep and easy to use. Literacy and Math Centers will be engaging and fun with this Playdoh Center. Included in this is Number cards, alphabet cards, CVC cards and CVCe cards.